The arguments over the Constitution as a whole occurred most intensely in the period between the signing of the Constitution by 39 state delegates at the Constitutional Convention on September 17, 1787, and the date of the thirteenth (and final) state’s ratification of the Constitution in 1791. It is hard to comprehend now the extremely arduous process of ratification, as the pros and cons of adoption were argued state-by-state. The ideological issues at stake in the formation of the new government were presented and analyzed most publically through essays and letters published under pseudonyms in local papers. The most influential of these writings are now known as the Federalist and Anti-Federalist Papers. The Federalist Papers, 85 essays in favor of the new Constitution, were written by Alexander Hamilton, James Madison, and John Jay under the common pen name “Publius,” and published over a ten month period in the New York press. 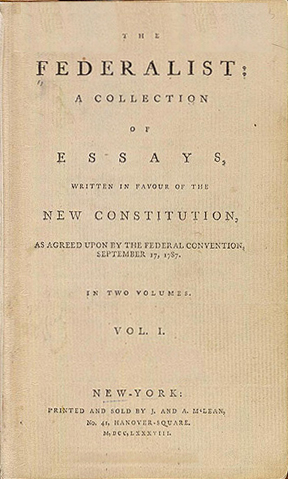 The Federalist, a two-volume bound collection of these writings, is considered an essential guide to understanding the intentions of the Constitution’s framers. The essays explain in detail many provisions of the Constitution, and the reasons for their inclusion. 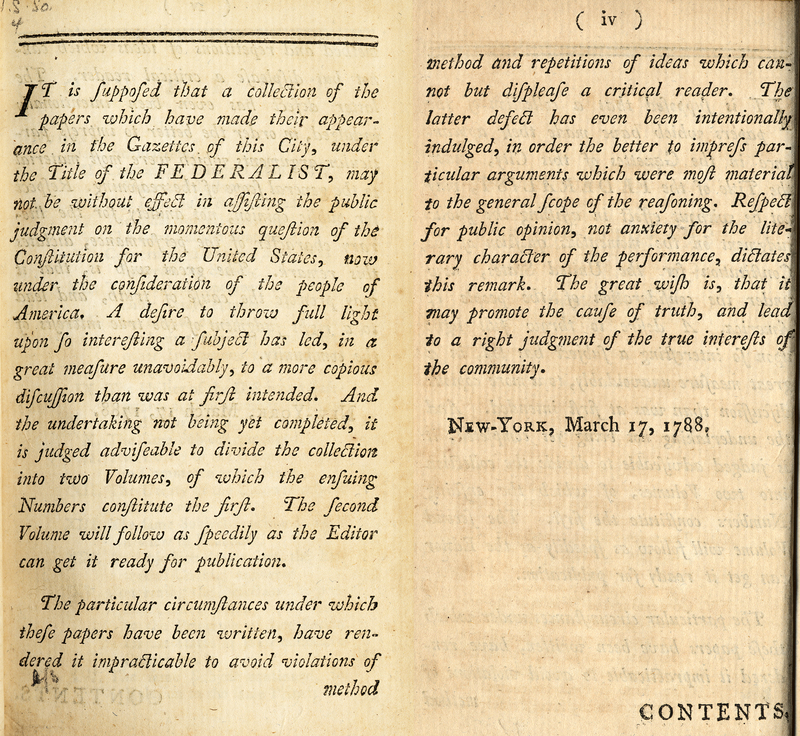 The first edition of The Federalist was published in 1788 by printers J. and A. McLean. The anonymity of the authors was maintained in this edition. By the 1818 printing, they had been identified as Hamilton, Madison, and Jay. Alexander Hamilton was the most prolific of the three, penning 52 of the 85 essays. Amherst College holds a particularly good copy of the first edition of The Federalist, acquired as part of the library of Dwight W. Morrow (AC 1895). Examples of the Federalist and Anti-Federalist Papers and other items in our collections related to the early Constitutional debates will be on-view at Amherst College Archives and Special Collections beginning on September 17.